According to new statistics relased by Gartner and Barron Apple is still steadily climbing in the US computer market with it share now standing at 9.7%. 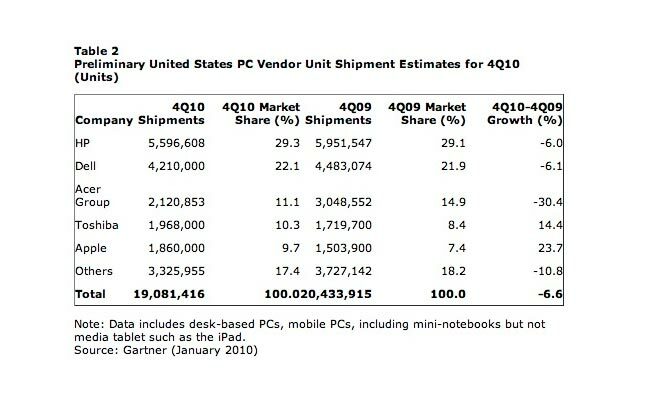 Preliminary computer numbers in the U.S. showed Apple (AAPL) jumped from 7.4% of total shipments a year to 9.7% in Q4, a 24% rise, the largest unit shipment increase of any vendor. The overal percentage may not seem massive compared to other PC manufactures, but the statistics didn’t look so rosie for the likes of Dell and HP with HP losing 6%, Dell losing 6.1% and Acer losing a massive 30% in the U.S. market. However PC manufacturer Toshiba showed signs of growth gaining 14.4% moving just above Apple with 10.3 % overall.